In Australian media news this week, Fairfax signs a deal to launch an Australian version of The Huffington Post, BBC.com tops one million viewers, Bauer creates a global umbrella for its digital businesses, Fairfax releases more announcements, The Guardian reports stats attributing traditional TV viewing decline overseas to Netflix and other streaming services, and Twitter syndicates promoted tweets on Flipboard and Yahoo Japan. 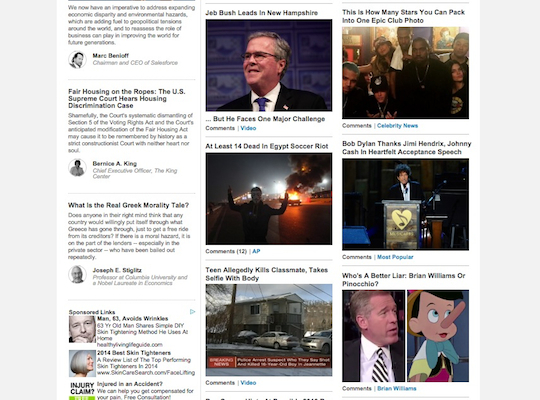 Fairfax Media will launch an Australian edition of US news and opinion website The Huffington Post. The company announced its multi-year partnership with The Huffington Post Media Group this morning on in its publications, The Australian Financial Review and BusinessDay. The Australian edition of the site is set to launch in the second quarter of 2015 with a Sydney-based staff of about 12. The team will produce local content and curate content from the company’s overseas network of sites. The Huffington Post will maintain overall control, with Fairfax likely having a 49% interest. Huffington Post chief executive Jimmy Maymann said the company only launches in markets within which it has “a realistic expectation of breaking even within three years” and the ability to “build a top-five player in the category in three to five years”. The news follows Friday’s revelation that mining magnate Gina Rinehart had sold her 14.99% interest in Fairfax Media, claiming the company lacked direction. BBC’s international site, BBC.com, has had its best month ever in January, with 101 million unique browsers and 1.35 billion page views. In Australia, the number of unique visitors to the site increased 32% to 4.7 million. The categories that saw the highest growth included news, auto, culture, capital and travel. Year-on-year figures for unique browsers are up 67% on mobile and 45% on tablet. Bauer Media Group has announced that its digital businesses will now fit under the global umbrella, Bauer Xcel Media. The move is part of the company’s accelerated growth plan to boost its success across TV, radio, digital and print, including a “substantial drive to acquire the best digital talent across the globe”. The new digital group will be led by executive board member Andreas Schoo and COO Markus Huessmann. 3AW is set to launch a new one-hour travel and food program, ‘A Moveable Feast’, hosted by Ross Stevenson and Kate Stevenson (no relation). Online subscription streaming services such as Netflix are eroding traditional TV viewing overseas, The Guardian has reported. Traditional TV viewing in the US has shown a 12% year-on-year decline, one of the sharpest since streaming companies have launched. In Britain, traditional TV viewing was down 9%, or four minutes, year-on-year in 2014. Meanwhile, revenue for online TV services in the UK increased 41% in the same period, The Guardian reports. Netflix is set to launch an Australian service in March. It will enter the market against local players including Stan (Nine and Fairfax) and Presto (Foxtel and Seven). Twitter has started its rollout of syndicated promoted tweets with partners Flipboard and Yahoo Japan. Advertisers who run a promoted tweet campaign on Twitter can now have their updates visible to users of these partner platforms. The company plans to start syndicating on other sites when deals are secured.